and fabric techniques with you! 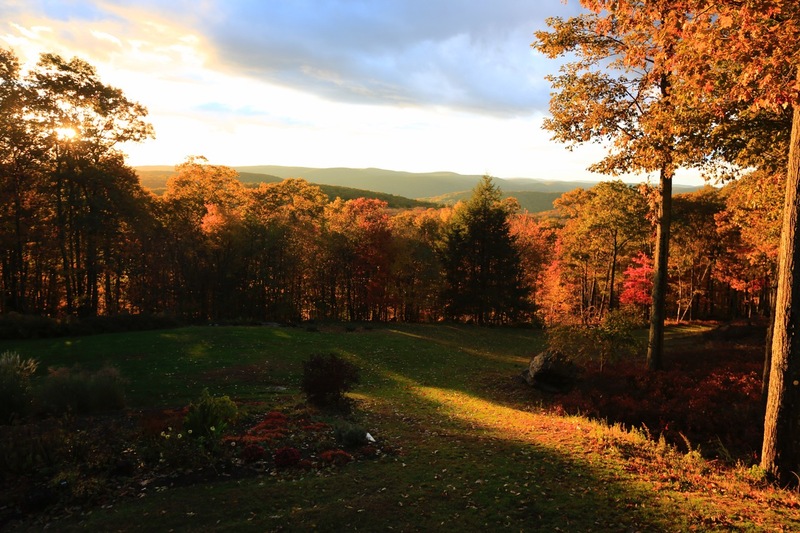 Our Fall sunset view in Connecticut with the oaks still hanging on to their leaves. After the high winds over the last couple of days, most are on the ground now! If you have taken a workshop with me or made an Accidental Landscape on your own, using either the book or the pattern series, you already understand the basic concept of an Accidental Landscape. 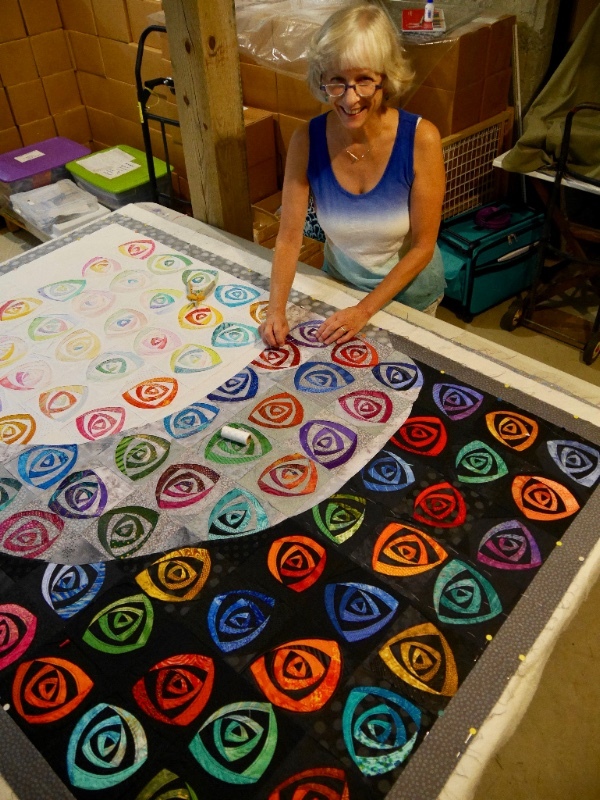 Fabric strips are free-form cut with the rotary cutter and arranged serendipitously to create a landscape. There are hundreds of variations in which the layers can be placed to accidentally create a scene. In the video I show you the magic of how changing a few strips can transform a beach scene into a mountainscape…and a few other surprise destinations! 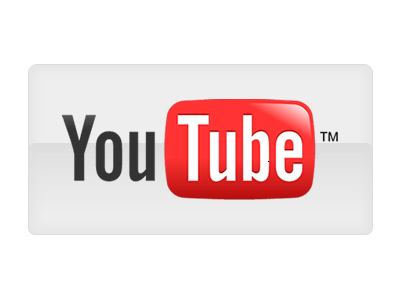 Here is a link for you to do some traveling without leaving the comfort of your home. Both were juried into the Pieced/Small category. I am so excited and honored! It's a nice way to celebrate 20 years of playing with my topstitch piecing technique. More to come, I promise! Directions on how to make the twirl blocks and the leaf blocks featured in the "Turning Over a New Leaf" quilt are in my Wiggles & Waves book. 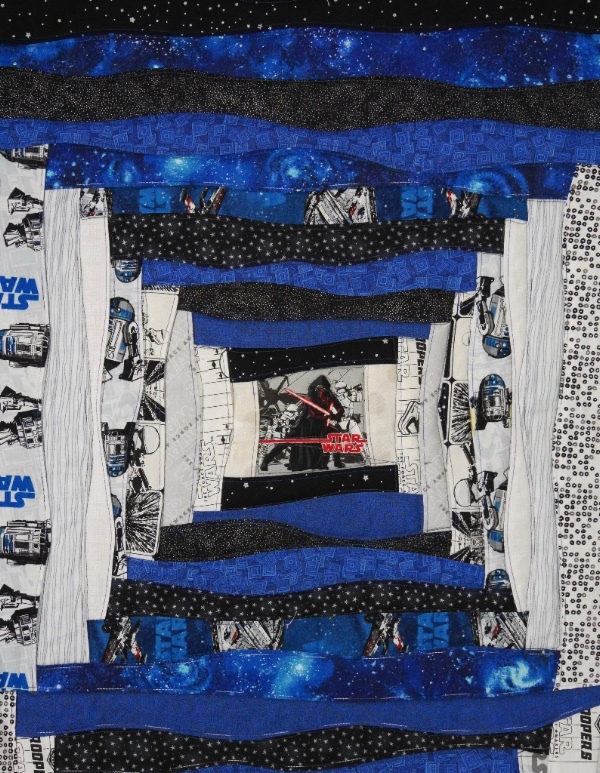 I had such fun collecting Star Wars fabrics for my grandson’s birthday quilt. I used my Large Layered Logs blocks (layered topstitch piecing from “Wiggles & Waves” book) and featured one of the theme fabrics in the center and the other theme fabrics in the layered logs. Although not intended, I was very pleased that if I used my imagination each block looked like the “Tie Fighter” jets in the movie! 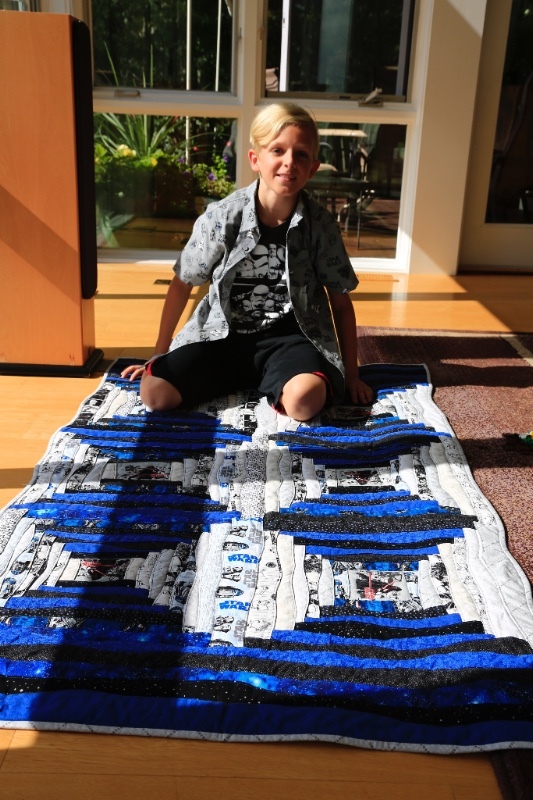 Notice that Rowen is wearing both a Star Wars t-shirt and a shirt that match his lap quilt (thanks to my daughter’s excellent planning that day!). 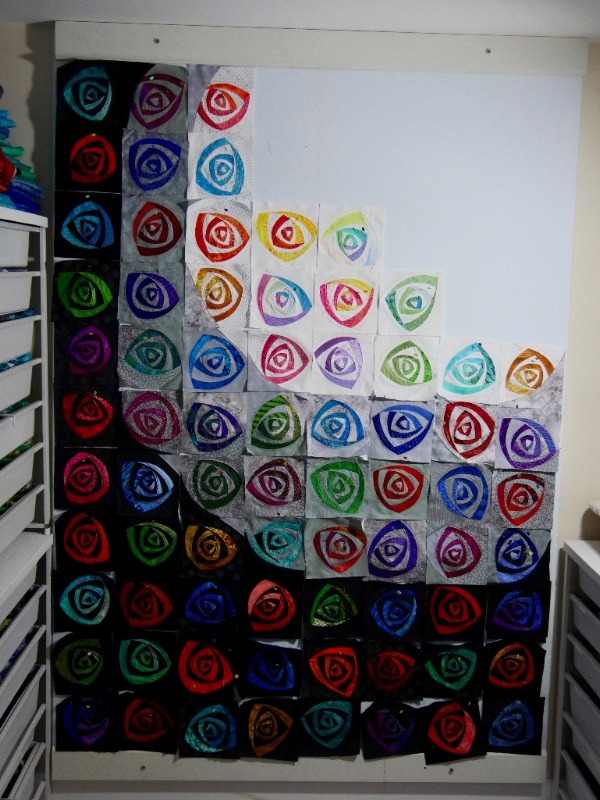 In the Summer Newsletter you saw the first 6 Color Twist blocks. My challenge was to gradate the Color Twists from black to gray to white backgrounds. In addition I wanted the blocks to gradually lose some of their basic structural elements and begin to disappear…in other words to get swept away. 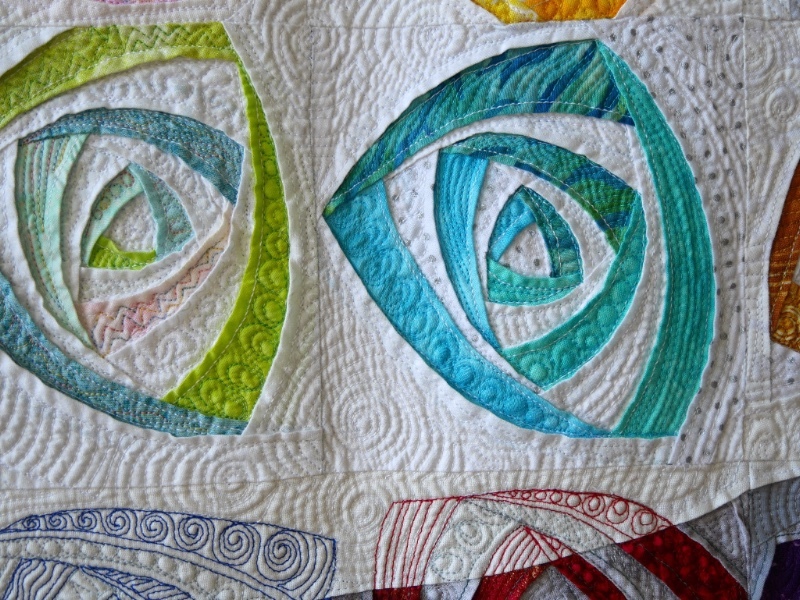 I certainly got swept away with every aspect of this quilt! The Color Twists on black are finished and the Color Twists on gray are added. Next come the Color Twists on white. At this point, the top row seemed to end too abruptly (see photo above), so I added a “swoop” to continue the curve upwards and over. 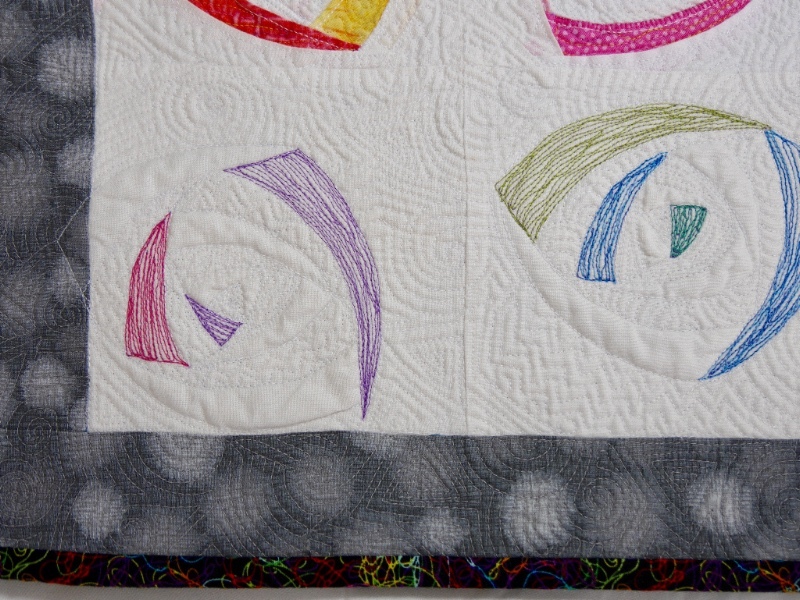 I also added a row of “ghost” blocks (plain fabric blocks, to be outline quilted like a Color Twist block). In addition, I was not happy with the straight lines where the gray blocks met the black blocks (refer to above photo again), so I added curved edges to soften the curves (left side and bottom right). Borders were added and here I am basting in the “Bastement” (an ordinary basement becomes a “Baste-ment” when you use it for that!). 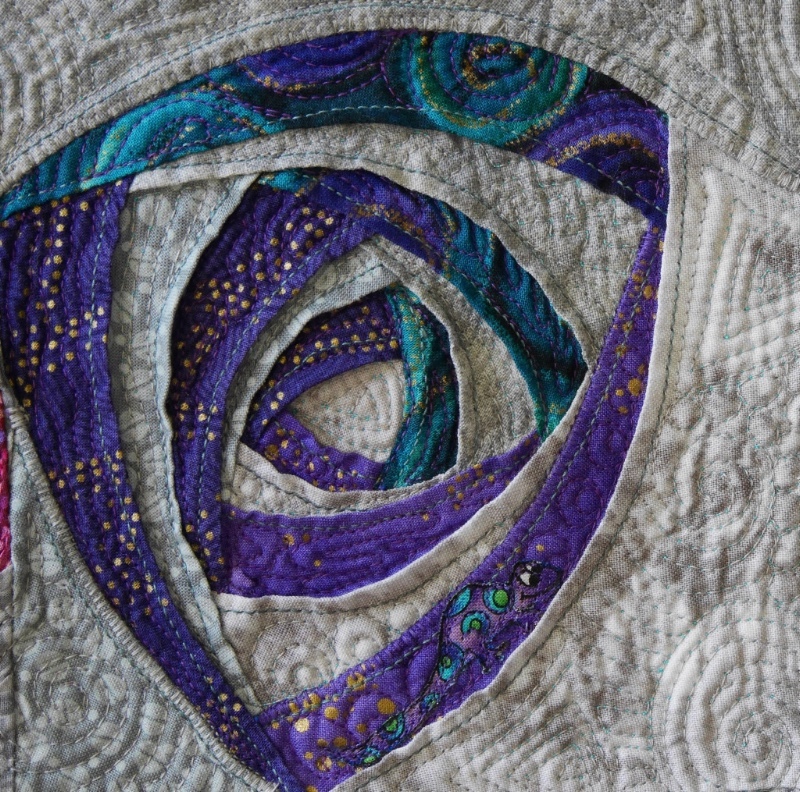 Next came a solid month of quilting! P.S. for my non-quilting friends/readers, BASTING is the process of thread stitching the quilt top, batting and back fabric to prepare it for quilting. 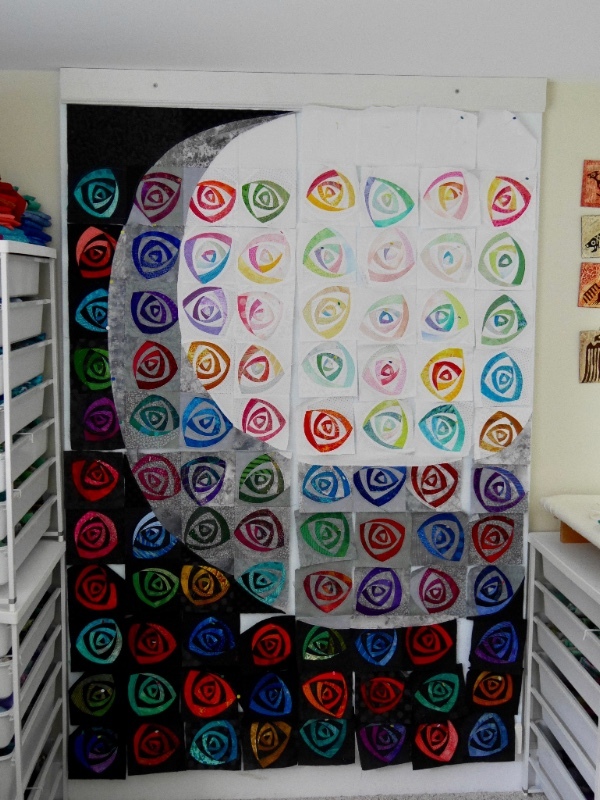 When the quilting was almost finished I was not happy about the top row of ghost blocks. The blocks simply disappeared too abruptly and the other blocks had not fragmented into smaller pieces as much as I had hoped they would. 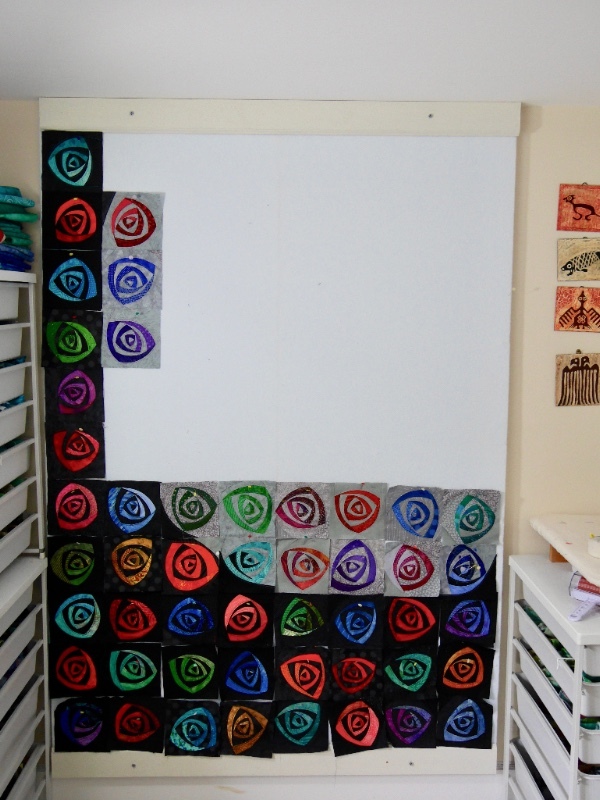 It was too late to go back to the drawing board, so I decided to experiment with painting certain sections of the block (not on the actual quilt of course, but on samples). 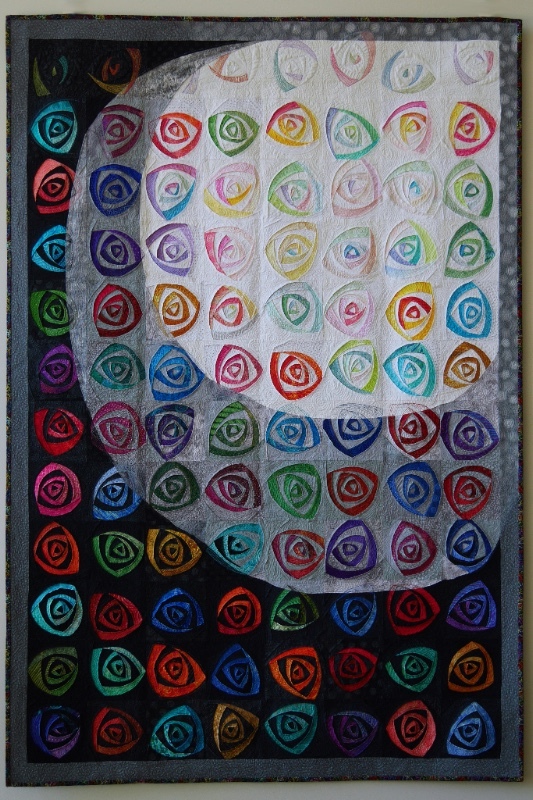 After some trial and error with fabric paints and pencils I realized that the color either bled past the quilting lines or it rubbed off. Not good! I was not very happy with myself at this point!!!!!!!!! I decided that thread painting would be the safest bet and it worked nicely. Thank goodness! Here are the “ghost” blocks before and after the thread painting. 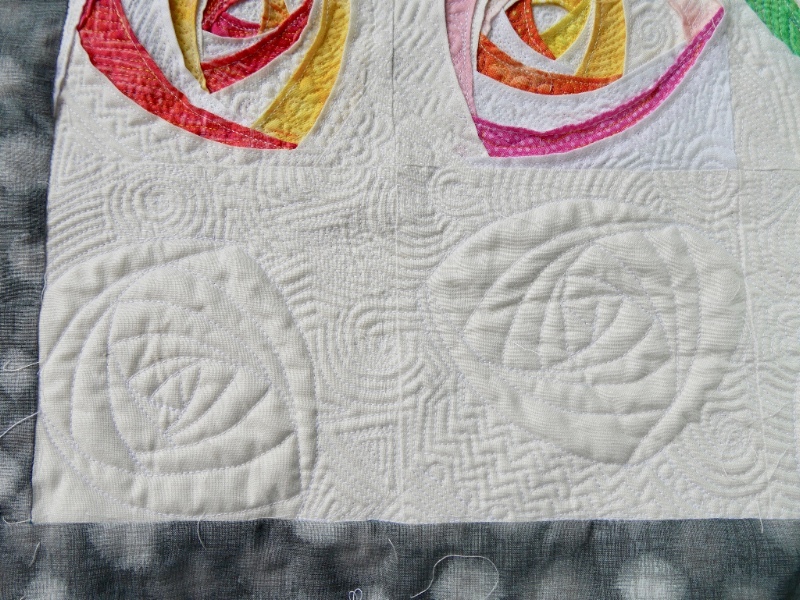 "Swept Away" in full size: 45" x 67"
The close-up shows the wonderful surface texture created by the topstitched blocks and quilting. 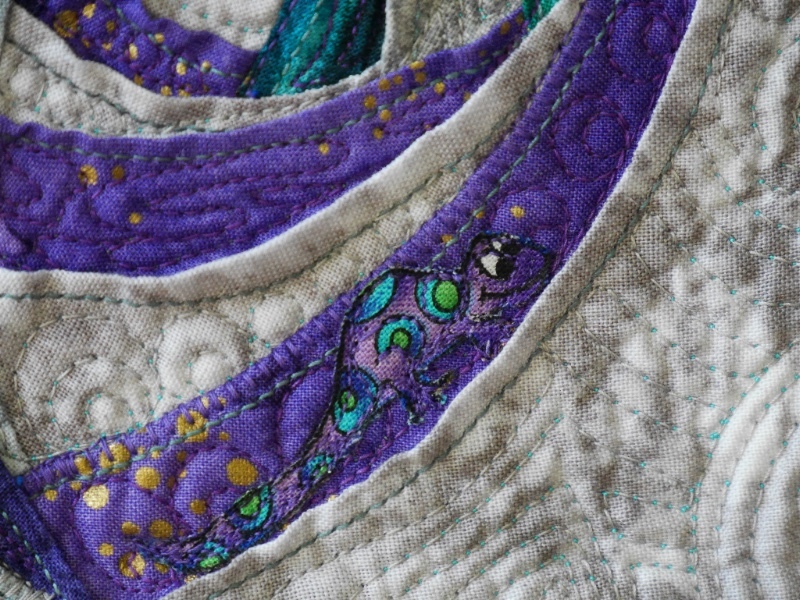 I almost forgot to show you where I hid my “lucky lizard” in this quilt. Here’s the hint, he is in one of the purple/gray blocks….camouflaged in the lower right arc. 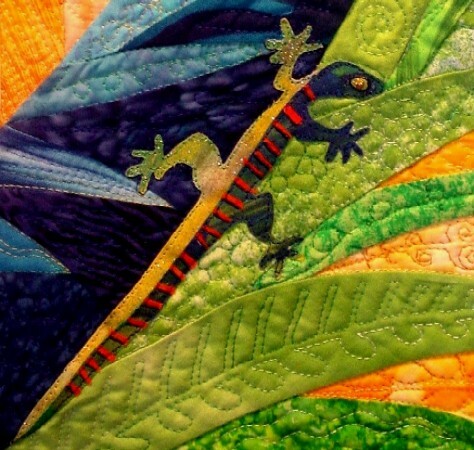 Here is a wonderful interpretation of my “Colorific Quilters” pattern from my Circle of Friends series of fusible flora, fauna and critters. 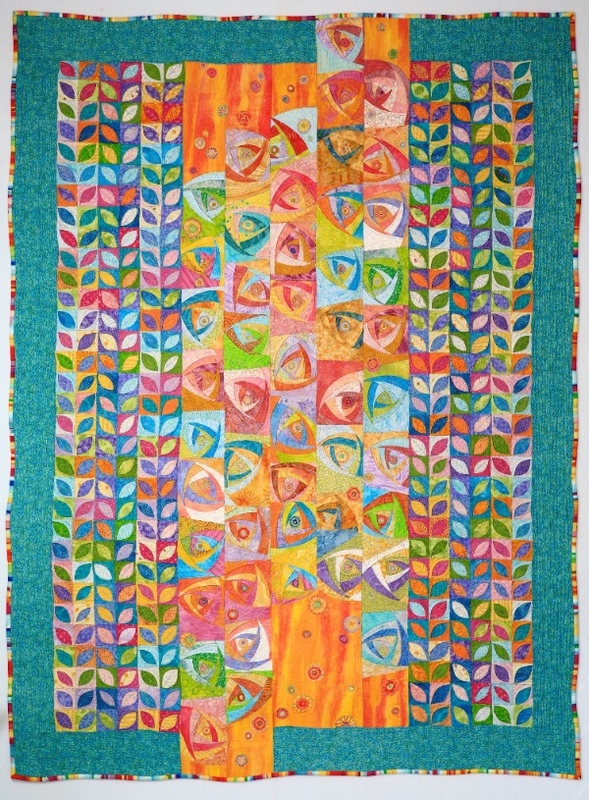 This pattern is a kaleidoscope of fusible friends and fashion. 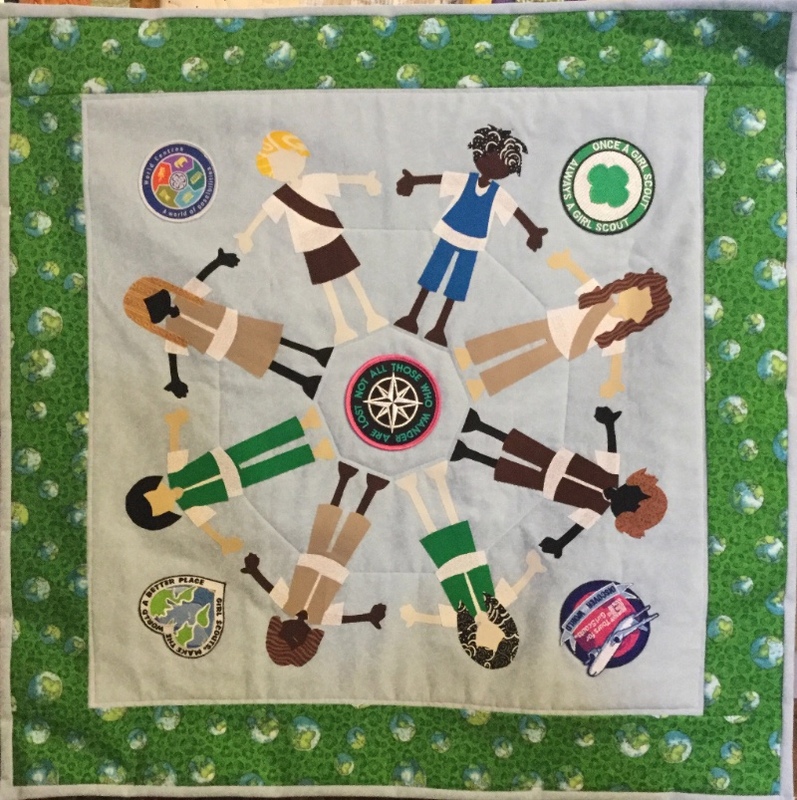 Sandra Norman’s version is a tribute to Girl Scouts. Super in every way. Thank you for the inspiration Sandra! 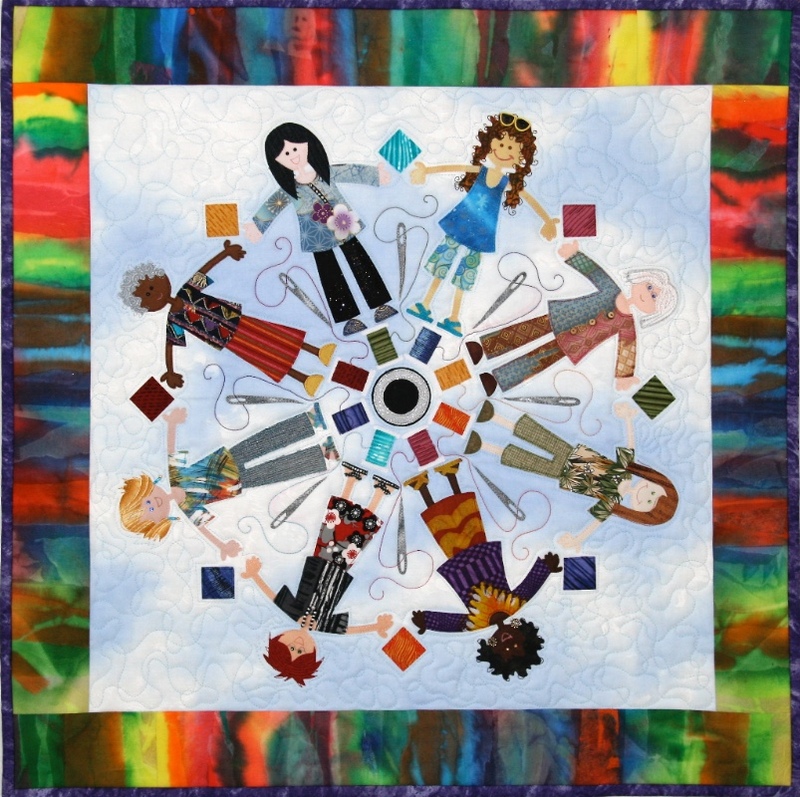 The Colorific Quilters pattern features your quilting friends, but with a little change here and there it could be a knitting group, book club, hiking group, etc… Use your imagination like Sandra did and make a tribute to your favorite group of friends or family. Here is a link to my website page, which has all of the Circle of Friends patterns about half way down the page. 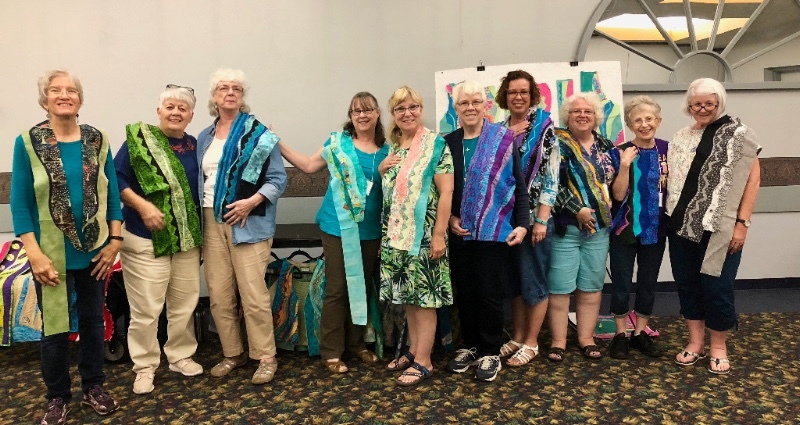 This past Summer I taught workshops at the Maine Quilts Show in Augusta Maine. 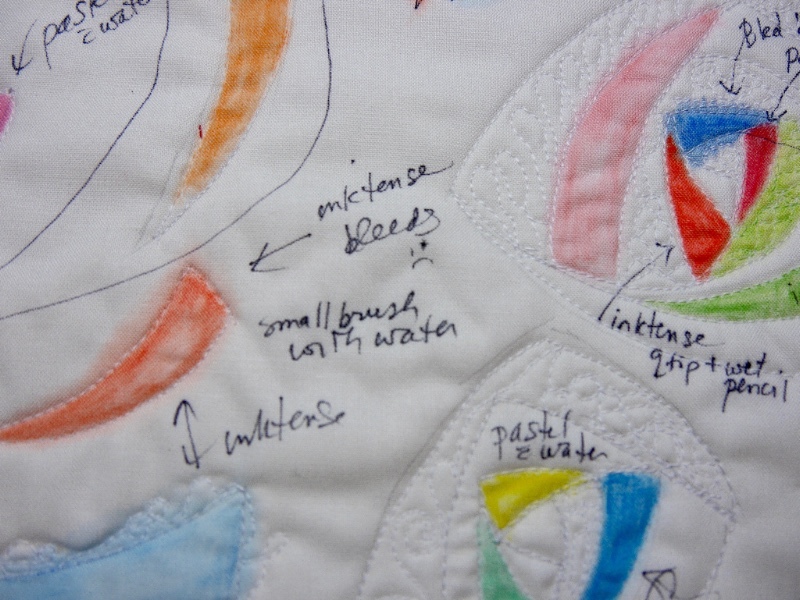 One of the workshops was the Quilted Waves Vest. Here are my happy and very amazing students modeling their “in-process” vests. Looking mighty fine! Directions are in the Wearable Waves book. All jackets and vests are based on a lightweight sweatshirt, which is also the pattern. 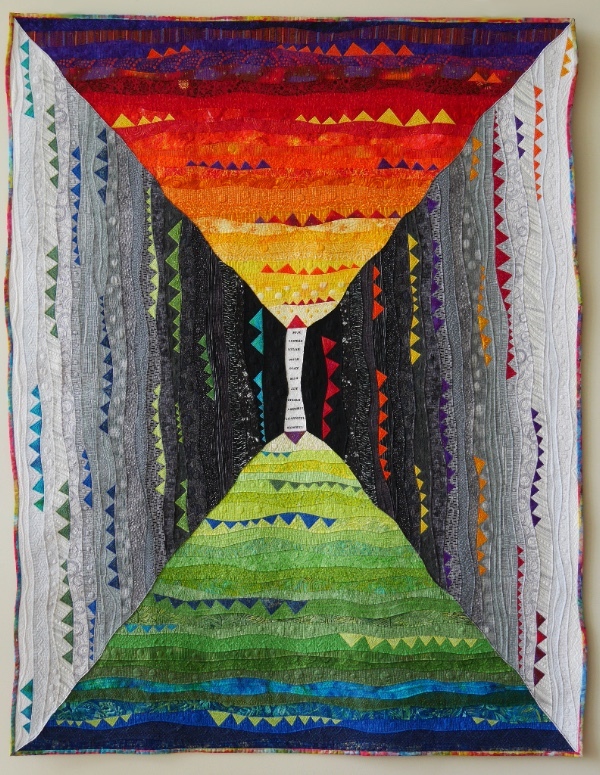 The fun begins when we create the topstitched curves, triangles and angles! I’m the featured national teacher for this event. 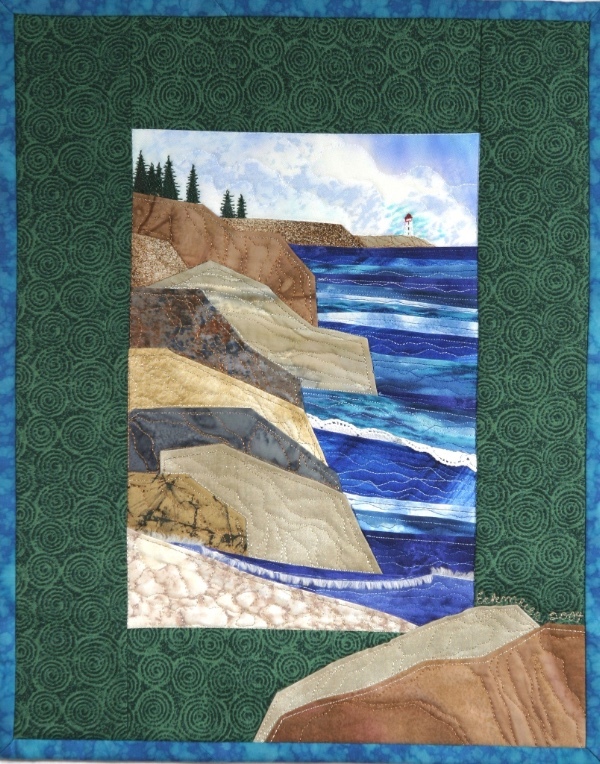 Byrne’s Sewing Connection (store), New Britain, PA April 2-3 Tues. EVE “Accidental Landscapes & Happy Villages Demo/Presentation, Wed. AM “Accidental Landscapes & Happy Villages Demo/Presentation”, Wed. Afternoon: 3 hour Accidental Landscape workshop (TBD). All the best until our creative paths cross again!